We’re on the eve of release for the Fortnite week 3 challenges, but the release times tend to shift a little bit every week. We know the new batch of goals will hit tomorrow, June 26, and the game client tells us exactly when thanks to a handy countdown. You can expect week 3 challenges to hit at 6:00 PDT / 9:00 EDT / 14:00 BST – give or take a few minutes, since the countdown only shows whole hours. You can watch them tick by yourself from the in-game challenges menu. As usual, you can expect three free challenges and four paid ones, with the completion of any four challenges granting you a normal bonus of 5,000 season XP. Epic hasn’t officially announced any of the goals just yet, but the upcoming challenges have leaked thanks to datamining from the folks at Fortnite Tracker. Whether or not you’ve bought the Battle Pass, the free challenges will ask you to deal 500 damage to opponents in a single match, use a launchpad, and follow a treasure map hidden in Flush Factory. The Battle Pass challenges will have you search seven chests in Fata Fields, find clay pigeon locations and shoot all five down, eliminate five opponents at Haunted Hills, and get three explosive weapon eliminations. 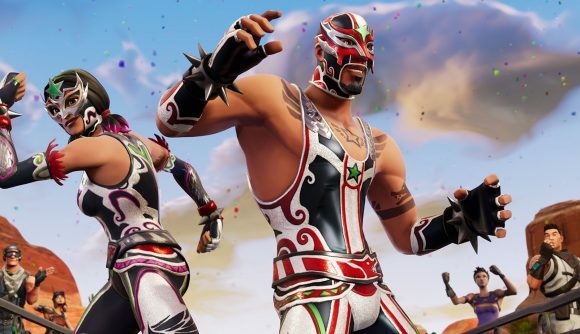 You can find more details on how to complete the leaked Fortnite season 5 week 3 challenges in our guide – assuming, of course, that Epic doesn’t make any last-minute alterations.